Raymond K.H. 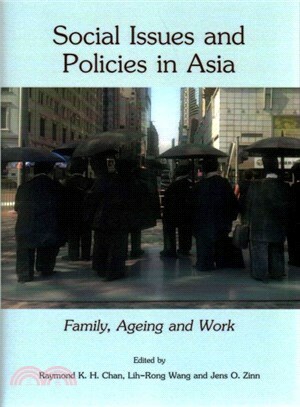 Chan is Associate Professor in the Department of Applied Social Sciences at the City University of Hong Kong. His research interests are in risk and social policy, comparative social policy, and family and labour policies.Lih-Rong Wang is Professor in the Department of Social Work at the National Taiwan University. She has conducted numerous studies in gender, social risk and social policy, such as Gender-based Violence Surveys in Taiwan, and Late Marriage Trends and Birth Behavior in Taiwan.Jens O. Zinn is Associate Professor in the School of Social and Political Sciences at the University of Melbourne. His research includes studies on risk perception and management, risk regulation and risk governance, as well as social and public policy.